Of the unexpected announcements at this year’s Worldwide Developer Conference keynote, one in particular stuck out for me: in iOS 8 and OS X Yosemite, Apple will offer DuckDuckGo as a search engine option in Safari. This has been near the top of my own Apple wish list for years, so much so that I even sent Tim Cook email about it. (Clearly, this announcement is the direct result of my suggestion.) In the past, the only way to use DuckDuckGo with Safari was to install the DuckDuckGo Safari extension on the Mac or to use the DuckDuckGo app on iOS. But let’s rewind a bit. Just what is DuckDuckGo? DuckDuckWhat? — Founded in 2008 by Gabriel Weinberg, DuckDuckGo is an Internet search engine, and alongside Bing, is one of Google’s few remaining competitors (Yahoo now uses Bing for its search engine). The more technical of you might be interested to know that the DuckDuckGo search engine is written in Perl, a programming language that has largely fallen out of favor with coders, but is tough to beat for text manipulation (most of the TidBITS site is powered by Perl). DuckDuckGo is the mom-and-pop shop of search engines. While Google has 49,000 employees, DuckDuckGo has 10, and until 2011, Weinberg was running the whole show. And as you’ll see, DuckDuckGo is used far, far less than Google or even Bing. For years, DuckDuckGo was about as bare bones as a 21-century search engine could be, but that changed with a redesign this year, which brought a fresher look, image search, image and video previews, and many of the other amenities offered by Google and Bing. So other than hipster cred, why would someone use such a tiny little search engine? In a word: privacy. DuckDuckSecret — You might think of Google as a search engine company, or a cloud service company, or a mobile operating system company, but in reality, those efforts are all designed to funnel into Google’s real business: displaying advertising. The vast majority of Google’s revenue comes from advertising (Google earned $15.96 billion in Q2 2014 alone, almost all from advertising). Advertisers rely on Google because it provides highly granular targeting of ads, to ensure that only the most interested potential customers see them. To accomplish that, Google gathers as much data as possible… about you. As much as Google is working to provide you with compelling services, the company is also packaging you up to sell to advertisers: to Google, you’re both customer and product. What exactly does that mean? First of all, unlike most search engines, DuckDuckGo tries to prevent Web administrators from seeing the search terms that brought you to their Web sites. That may be valuable to administrators for search engine optimization, but it comes at the cost of your privacy. (Of course, publishers also use it to determine what readers are searching for on their sites so they can better meet demand.) Also, unlike other search engines, DuckDuckGo doesn’t store a log of searches, nor does it employ tracking cookies, unless you want certain settings saved across sessions, and even then the cookie doesn’t contain personal information. DuckDuckGo’s commitment to privacy was once seen as kooky, but it’s now paying off. After Edward Snowden’s initial June 2013 revelations about NSA mass surveillance, use of DuckDuckGo has skyrocketed, relatively speaking, with direct traffic jumping from 1.75 million searches per day before Snowden to nearly 4 million searches per day within a few months. Today, DuckDuckGo serves nearly 5 million direct searches per day, which worked out to 159 million direct searches in June 2014. 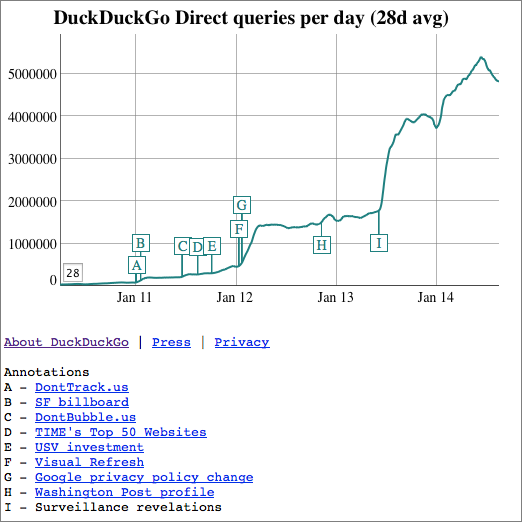 When you include API searches and bots, DuckDuckGo’s June 2014 search traffic topped 617 million searches. That’s still vanishingly small compared to Google (which handled over 12 billion searches in the same month) and even Bing (3.4 billion searches during that time), but it proves that there is a demand for privacy, even if it is a niche desire. Why wouldn’t you want a more private search engine? Because you trade privacy for better search results. DuckDuckDownsides — Google collects ridiculous amounts of data in order to connect you to the content you want and advertisers to you (and theoretically you to the ads that are relevant to you as well). This practice is demonized by some, but I consider the relationship between the user and Google to be more symbiotic than parasitic. Google search is an invaluable service provided at no cost to you, and you’d be hard pressed to find anyone outside Redmond who denies that Google has the best search engine available. Part of the reason for Google’s excellent search results is that Google collects your preferences and usually can predict what you want. DuckDuckGo does not do that, and its search results suffer. For instance, if I search for “TidBITS” on Google, this fine publication is the first result, because Google knows me well enough to understand that’s what I want. DuckDuckGo lacks that information, so we’re number four there. That’s a small example, but Google, thanks to Google News, is also much better at quickly gathering breaking news. When I see an event blowing up on Twitter, a quick Google search often pulls me into the loop. DuckDuckGo is more hit or miss. Deciding between Google and DuckDuckGo comes down to whether you want better search results or more privacy. The choice is yours. Fortunately, it doesn’t have to be an either/or decision. DuckDuckGo provides powerful tools that enable you to search hundreds of other Web sites as well. DuckDuckGo Tips and Tricks — Besides privacy, the other staple of DuckDuckGo is the “!bang” search. To search using another Web site or search engine, you append an exclamation mark and a text shortcut to a search. Here’s an example. Let’s say I search DuckDuckGo for iPhone 6 but don’t like the search results. I can add a !g to the end of that search, turning it into iPhone 6 !g, which sends the search to Google instead. Most !bangs are obvious, so if you wanted to search Google Images, you’d use !gi. Those will get you started and are easy to remember, but there are thousands more in the full list. You can also search Apple’s Web site, Ars Technica, Boing Boing, Best Buy, eBay, GitHub, Gmail, and just about any site you can think of (except TidBITS — I should submit us as a new !bang). There are many other neat DuckDuckGo tricks, and I’m learning more all the time. For instance, searching for weather brings up a clean, minimalist forecast from Forecast.io (you need to set a region first from the DuckDuckGo home page). Search stopwatch to pull up a stopwatch app. Here’s a cool one: type password 20 strong to generate a random, 20-character password. There are some other handy tips at MakeUseOf, and here’s a full list. So What’s the Point? — You may be thinking, “If DuckDuckGo’s results aren’t as good as Google’s, then why bother?” For me, there are two reasons. First, even if I end up sending my searches back to Google half of the time, that’s still half as much data as Google would have collected from me otherwise. Again, this is a tradeoff; in theory, my personalized search results at Google suffer a bit, but I retain control of some of my online privacy. Second, I’ve become addicted to the !bangs to search my most-used Web sites without needing any platform- or app-specific tools. Once you learn the DuckDuckGo !bangs you need, you’ll be set, whether you’re browsing on your iPad, iPhone, or Mac. 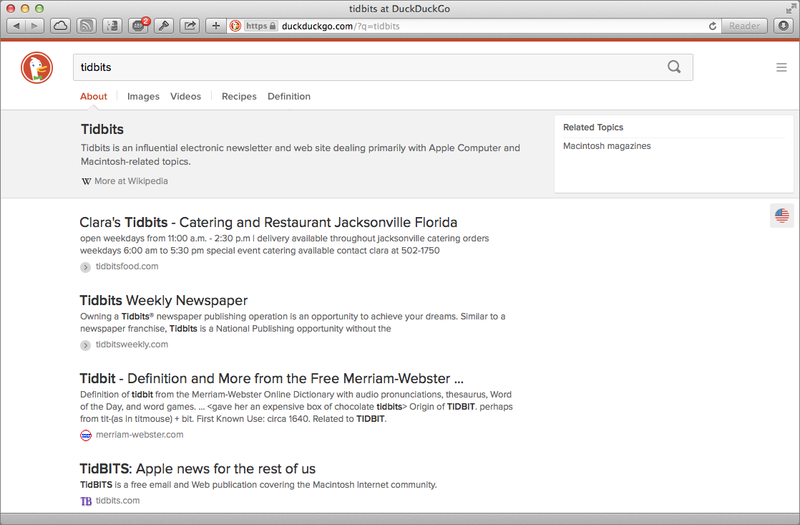 So why is Apple integrating DuckDuckGo into Safari? I think that’s obvious — Apple and Google aren’t exactly chummy these days, and Apple is looking to replace Google or offer alternatives in every possible way on its devices. I wouldn’t be shocked to see Apple purchase DuckDuckGo or create its own internal search engine (much as it did with Maps), though there’s nothing to indicate that Apple is considering such a move. Even given Apple’s cold war with Google, the integration of DuckDuckGo was a surprise. 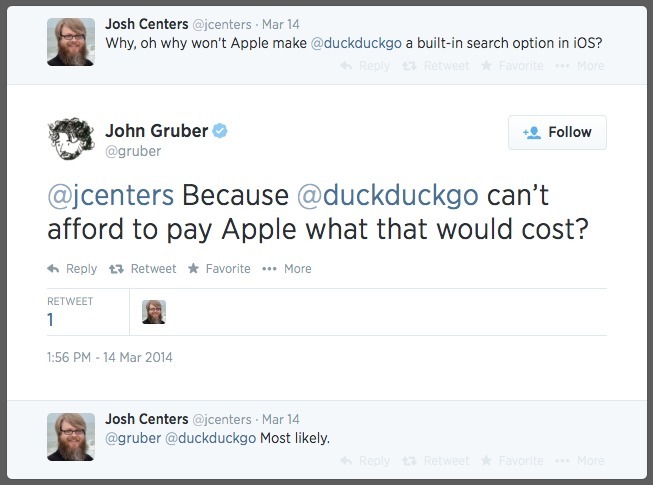 Just a few months ago, Daring Fireball’s John Gruber implied that DuckDuckGo probably didn’t have enough money to offer Apple in order to be integrated into Safari (sorry John, small bite of claim chowder, though I reluctantly agreed at the time). Frankly, I was surprised too, but adding DuckDuckGo makes perfect sense. It’s a way for Apple to become less reliant on Google, it’s a nice chip to back up Apple’s claims of superior privacy, and it’s yet another option for users — something Tim Cook’s Apple seems happy to provide. Good article. I look forward to iOS integration. I've been using it via a bookmark on my favorites bar. Thanks for the tips on the special features. I will be reading them. BTW - Duckduck gives me better results than Google anyway, although neither is as good as the old Alta-vista search engine. I use PopSearch to access DuckDuckGo as the default search engine. DDG has met 90% of my search needs. Thanks for the !bang (shades of UNIX) tip. Being embedded as a choice in the Safari Mobile browser will greatly improve DuckDuckGo's reach. I use a plugin in Safari to make DuckDuckGo my default search. However, on my iPhone and iPad, I use Google because I have no choice. I wonder how Apple decides on the "default browser" on iOS devices. If Apple switched the default search engine from Google, Google's market share would drop by about 5% to 10%. DuckDuck needs the ability to restrict searches to time periods. I use this feature all the time in Google. They also need the ability to restrict searches to quoted material instead of individual words and to have mandatory present or absent words on those pages. Ixquick.com is a similar privacy-friendly search engine (the version called startpage.com uses Google results). I wrote a short note on DDG in my own "news bulletin" and decided to do some real testing/comparison between DDG & Google & Bing (Bing was usually less good than Google (but not always) so not so relevant). What most surprised me in the testing is how much better Google search have become as of late, which I had not really noticed before. I am often searching for small locations in other (non-English speaking, nor in my own country (Sweden)) countries, but usually only found websites gaming Google search engines by geo-caching (or what it's called - sites automatically collecting data around geographical place names (like Facebook's pages that exists for nearly every place)) and a billion of sites always in english wanting to sell a hotel room some 100 miles away from the place I was looking for ... . Much of those results are gone (esp. the selling sites without Google ads), but still many of those auto-generated sites are displayed in the search results, and esp. so if they feature Google ads (guess that is a way to make some revenue out of "parked" domain names). Anyway, I also get more relevant info in Google now too (even though they really have no way of understanding what I am searching for). The best thing with DDG is that they do not look at my location when performing search (I am almost never interested in searching about something nearby ...). A lot of extra functionality is really taking for granted these days of search engines and DDG seem to be able to hang on to Google in this development. Also note that one can turn off advertisements in DDG in the settings on their page, but they need to get some revenue too ... . If only people were interested in searching better. :-) Most people just tap a couple of words into Google and get good enough results, so the extra knowledge and effort necessary to target searches precisely isn't something most people wish to deal with. I don't understand why no one has ever checked into startpage.com when discussing privacy. It searches Google but hides your IP. Interesting. I wonder if any of the TidBITs staff have tried it. I've heard of it. The reason we covered DDG and not Startpage is because DDG will be integrated into iOS 8 and Yosemite. What is the business model for DDG ? How to they make $$$ ??? Display ads and Amazon referral links. Currently I use Startpage within Goole. My question is Duk,Duck,Go significantly better? I never use the Internet while signed-in to my Google account (I only use GMail on a very limited basis). Does that affect the quality of my Google/Startpage results? Am I correct in assuming that Google needs to associate my searches with my Google account in order to return personalized search results? I suppose that my basic question is whether I gain anything by using Startpage vs. DuckDuckGo?